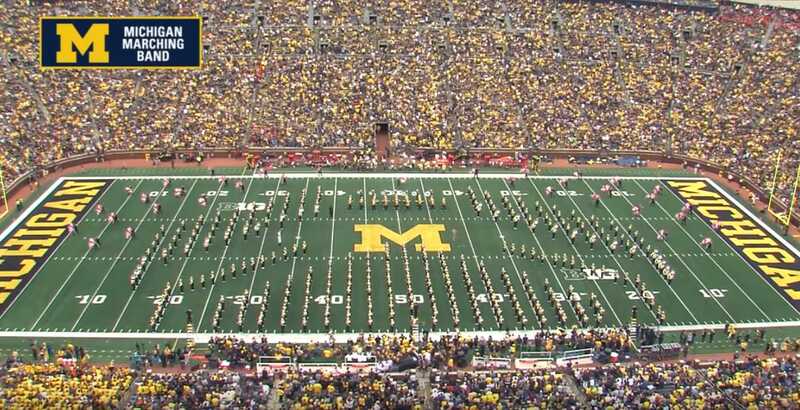 The Michigan Marching Band was back in the Big House this past Saturday and once again wowed fans at halftime. In December of 2016, the Broadway world was gifted a beautiful modern musical called Dear Even Hansen. The show centers around Evan Hansen, a high school senior with severe social anxiety, which inhibits his ability to connect with other people and make friends. After the death of one of his classmates, he fabricates a lie that inadvertently brings him closer to the classmate's family, while also allowing him to gain his own sense of purpose. The show is absolutely wonderful and has received incredible critical acclaim. It was nominated for 9 Tony's winning 6 of them including Best Musical at the 71st Tony Awards. Michigan has a special tie to the show. The music and and lyrics were written by Benj Pasek and Justin Paul. Both are Michigan Musical Theater alums. At the start of the show they appeared on the jumbo screen to introduce the performance and thank the band for saluting their music.